Do you drink coffee? Tea? Hot chocolate? Each year, over 14 billion paper cups are used for our daily java fix. Want to make a difference (and possibly save a few buck)? Invest in a reusable travel mug! You can recoup the monetary cost of a $15 travel mug in as little as 30 trips to the coffeeshop (or a single week for us). 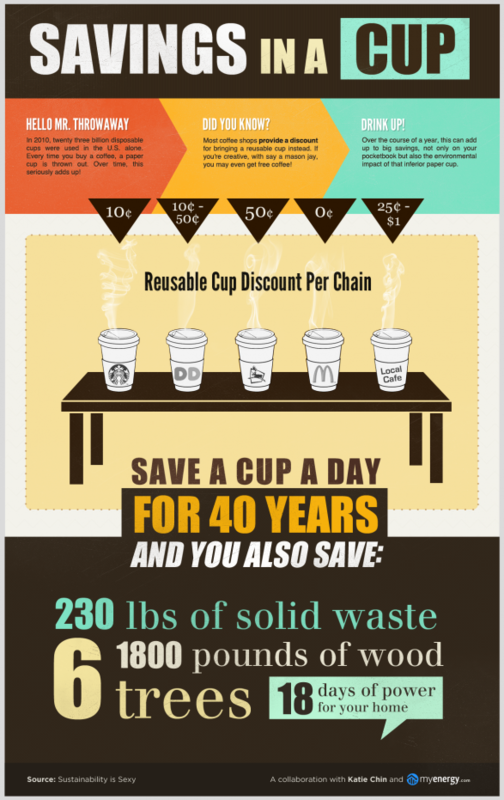 In that same amount of time, you will have offset the resource cost of your new mug by saving 30 paper cups. What a deal! Ready to purchase your own mug? Check out this CarbonRally challenge! So far, nearly 13,000 individuals have pledged to bring their own mug, resulting in nearly 8 tons of reduced carbon dioxide.